In the caucasian upper eyelid the deeper layers of the eyelid converge 6 to 8mm above the eyelid margin/eyelashes to create a crease (labeled upper lid crease in the diagram above). In the typical asian upper eyelid these layers do not converge so there is no crease. 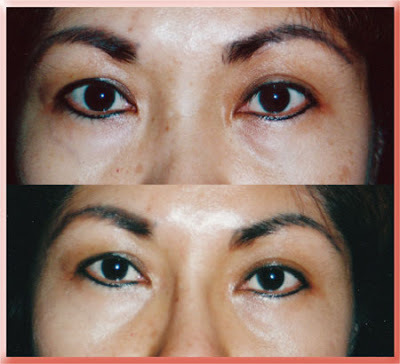 The absence of this convergence allows fat to descend into the eyelid (as noted in the diagram above) giving the puffy look that is seen in some asian eyelids and the no upper eyelid crease appearance. the eyelid cartilage in order to create a crease. The puffy look is thereby also diminished. The suture used is absorbed by the body but the healing process keeps the new point of convergence intact. This is referred to as double lid or double eyelid surgery because just one surface of the skin is visible without a crease while the addition of a crease allows the viewing of two skin surfaces. When there is just a single no crease eyelid makeup applied to the eyelashes tends to rub off onto the skin above when the eye is open. 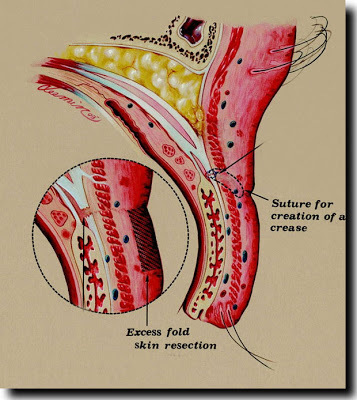 These sutures can be placed with or without the removal of upper eyelid skin as needed. The inner corners of the eye remain unchanged with this approach so that an Asian look still exists. To treat the fold at the inner corner of the eyes if it is present and if the patient wishes it addressed it is best to augment the nasal bridge. This takes up or lifts the excess skin and gets rid of the inner corner skin fold without leaving any visible scar. Some minor surgical procedures have been devised to treat the inner corner folds but these leave scars in the area and do not address the root problem which is insufficient nasal bridge in the Asian nose. 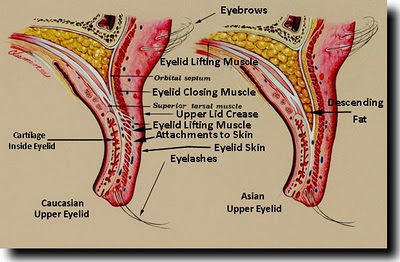 As mentioned above this is the typical asian eyelid. 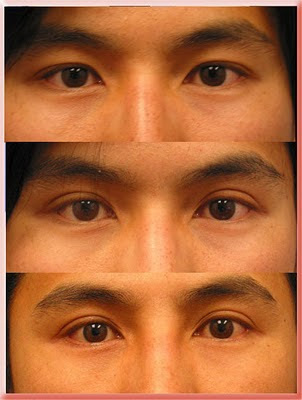 However in reality there is a spectrum of asian eyelid appearance with an almost caucasian appearance at one end and the very asian appearance as depicted in the first diagram above at the other end. The surgical approach must then take into consideration what the patient wants to change and where they lie in this spectrum. Also each eye may be on a different part of this spectrum. The upper photo in this set is before surgery. The middle photo shows the result after a blepharoplasty with removal of skin and placement of sutures to adjust the upper lid crease position (as in the second diagram above)-a double lid procedure. The lower photo was taken after a radix implant was placed at the root of the nose to diminish the inner eyelid skin folds. This patient had a rhinoplasty with a bridge implant but no direct surgery on the eyelids. This demonstrates how the inner upper eyelid skin fold can be addressed with an implant. By diminishing this fold the distance between the inner corners of the eyes appears to be less when in fact it is unchanged. Although this is not a case of double lid surgery this Asian patient had hanging excess upper eyelid skin. The excess was so severe that the overhanging skin partially blocked her visual field. Because of this sensory deficit such procedures are covered by health insurance. In this patient I only removed the excess upper eyelid skin.